The Dark Faerie: Happy Monday! Hello everyone! It's a beautiful and cool day here in Allentown and I am loving the change in seasons. Fall has always been my favorite and I am getting excited about Halloween, baking and just snuggling up with my family. I have been in the studio catching up on commissioned pieces and I am about to start preparing for two upcoming events. If you live in the area of either of these events please stop by and say hi!!!! Also…I have a very special sale happening now in my Etsy Shoppe. 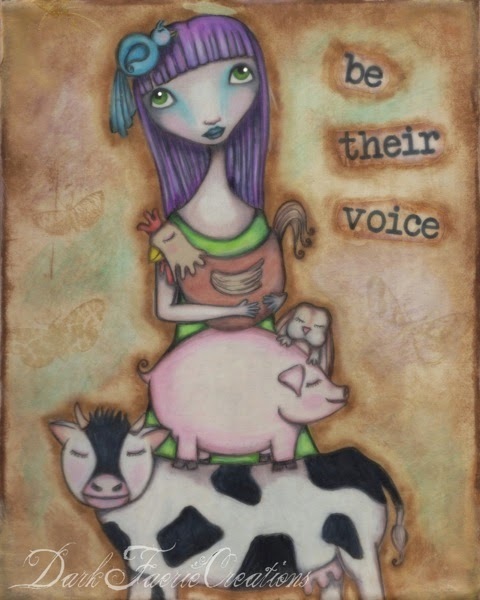 This week only I am offering my "Be Their Voice" print for only $10 (plus shipping). This is half off my regular price. My love goes out to my compassionate friends and fans. It's never too late to make a change and adopt a plant-based diet. Our planet is depending on you! Baking & snuggling sounds wonderful. I bet Fall/Halloween is a busy time for you; your gorgeous work goes beautifully with the deep colours of the season. Awww thank you! Busy indeed!